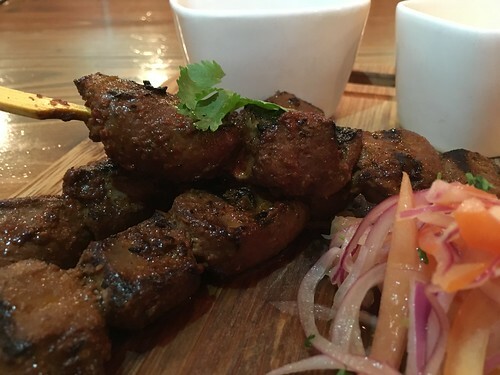 We have always enjoyed dining at Cocina Peruvia so we knew that another trip to this much loved restaurant was not to be missed. As if first timers, we went through everything on the menu one by one. And for a restaurant where everything is good, the options are endless! Thank God we had Mark the Manager and Chef to help us choose the perfect dishes for the night. 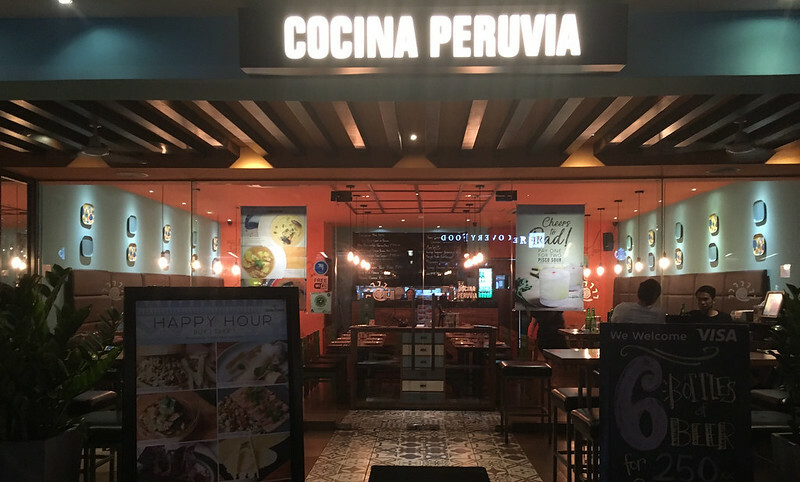 Fun fact : Cocina Peruvia of the Mother Spice Food Corp was conceptualized and birthed when owners Mr and Mrs Teng discovered their love for Peruvian food after a trip to the beautiful country of Peru. 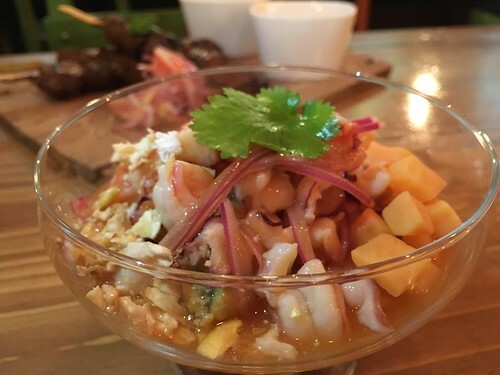 We started with the Ceviche Mixto or the Mixed Seafood Ceviche made of shrimp, mussels, squid, and octopus drenched in lemon juice. This mix is similar to our local “kinilaw”. Both sweet and zesty, the bustling flavors of the seafood selection, the Peruvian Chili (Aji Ricoto), and the citrus base bring a burst of unique taste, the best way to start a night of gastronomic adventure. 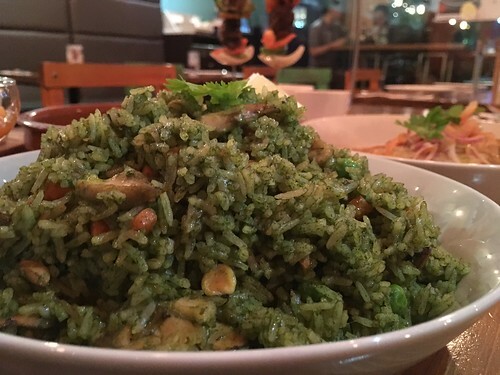 We ordered two kinds of rice – the Arroz con Mariscos (Seafood Rice) and Arroz Verde con Pollo (Cilantro Chicken Rice). We loved both, but the Cilantro rice won our hearts. The unusually distinct taste of the cilantro extract mixed with chicken and corn kernel was probably our favorite discovery from Cocina Peruvia and with this dish alone, our night was already made… and our minds made up that we would definitely keep coming back to the restaurant, if only for this. 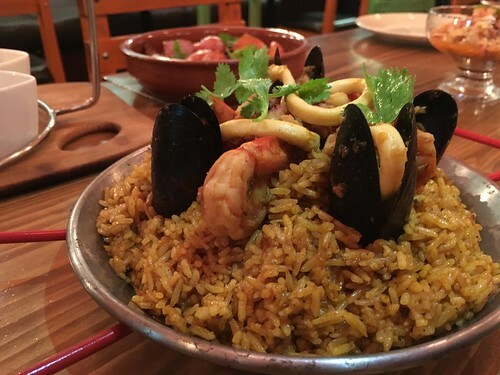 The Seafood rice, on the other hand, reminded us of the Paella Valenciana. The taste of the sea is strong in this one so for seafood lovers, this rice plate is highly recommended. 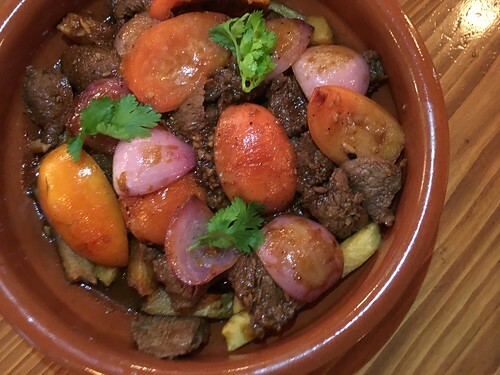 We wanted to try something new so we decided to get the Lomo Saltado (Beef Saltado), a traditional Peruvian dish made with strips of sirloin and “french fries” marinated in chicha de jora or corn beer and white wine vinegar with paprika, cumin, onions, tomatoes, and different types of chilies and pepper. The sweetness from the tomatoes stood out, a taste that we totally enjoyed and somewhat reminded us of our local bistek. Of course, a trip to Cocina Peruvia will never be complete without ordering our all time favorite, the Adobo Peruvia. These thin slices of pork belly cooked in cream topped with onion and tomatoes have and always will be the star of all our meals in Cocina Peruvia. The thin strips of fat from the pork go so well with the cream sauce making every bite a burst of heaven in the mouth. Another staple from this well loved restaurant is the Brochetas de Lomo y Pollo (Beef and Chicken Brochetas). The meat (especially the lomo or beef), so tender and juicy that we were almost sure we felt them melting in our mouth. Tasty on their own actually, but the aji amarillo and chimichurri sauces gave them an edgy twist. For reference, yes we can compare this dish to a Middle Eastern kebab. 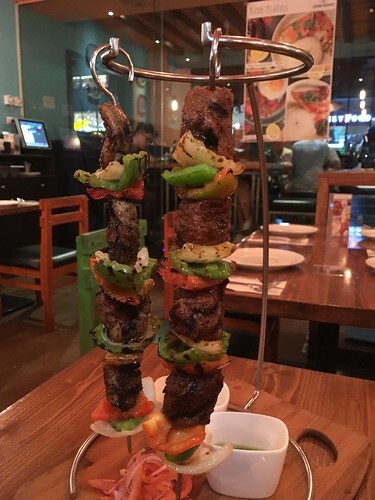 We were also feeling adventurous that evening so there was no better way of giving in to that feeling than ordering a plate full of beef hearts or the Anticuchos de Corazon. The texture was chewy and flavor meaty and to be honest, really addicting. It came with their famous Aji Amarillo and Chimichurri sauces which added flavor to the already tasty meat. 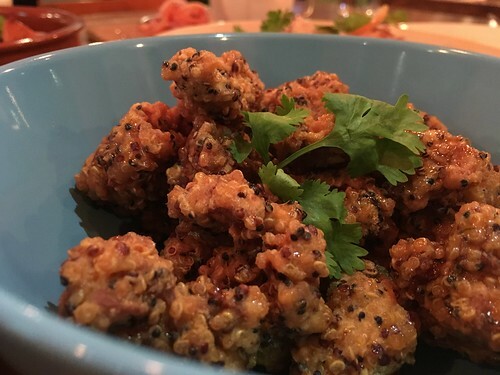 Our last order before we moved on to the desserts was the Pollo Quinoa or the Quinoa Chicken Poppers. It was a blend of salty and sweet and we especially loved the mango sauce that added a tropical tone to a favorite chicken popper staple. We even ate this starter with rice, instantly turning a snack into a full meal. We were just as excited with the dessert as we were with the entire visit to Cocina Peruvia. We initially wanted to try their Panna Cotta but as always, it was not available. 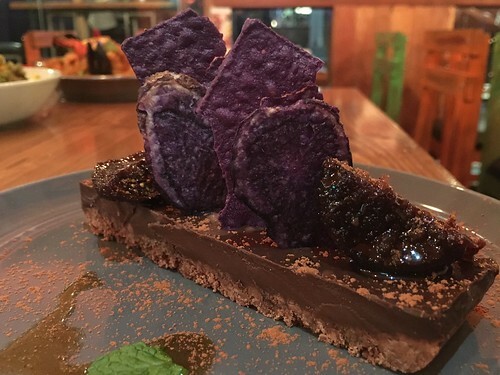 Instead, we got to enjoy the Galera de Chocolate, an unusual Peruvian dessert made of dark chocolate tart with corn and potato chips, figs, and dates. These different ingredients may not be a common combination for a dessert but the final result was unexpectedly unique and delicious. The chips added crunch and texture and the dates and figs added character and excitement to the dark chocolate tart. To end the night, we all had a glass of the Pisco Sour. Again, another classic from Cocina Peruvia. 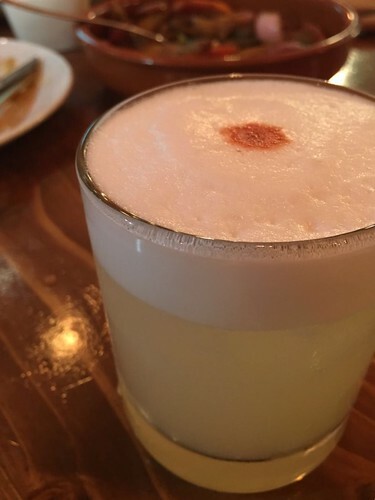 Its base, the Barsol Pisco, was enhanced by adding fresh lime juice and sugar syrup and ended with a thickly whipped egg white on top. If this isn’t the best way to end a night, then we don’t know what else is. 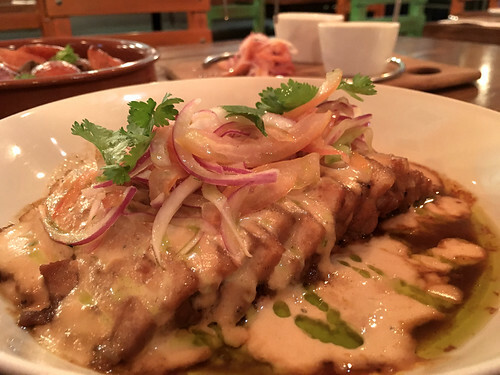 Cocina Peruvia has consistently been, without a doubt, one of our favorite restaurants. And this night’s visit once again proved that with every uniquely prepared dish, new and exciting bursts of flavor are always waiting to be discovered. Just like a favorite movie that we can endlessly watch over and over again, we will never grow tired of coming back to Cocina Peruvia and take comfort in their Peruvian inspired dishes that have been specially prepared straight from the heart. *Their 2nd branch will open at Ayala Vertis North on Oct 6, 2017.